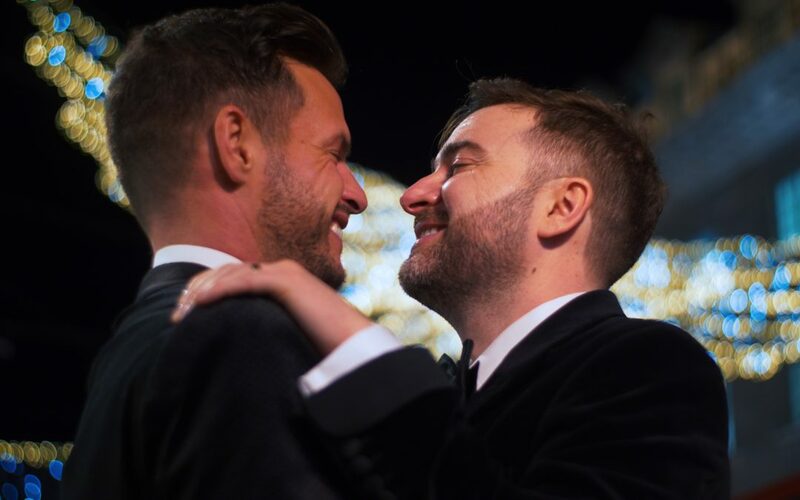 During the long darkness of a December day in London we found ourselves filming one of the most relaxed and fun weddings of the year between Luke and James at the Cafe Royal Hotel on Regent Street. With the Cafe opening in 1865 it’s seen it’s fair share of sights and guests of London. From royalty to celebrity and all notorious inbetween. Icons such as Muhammad Ali, HG Wells and Winston Churchill are known to have been patrons. Britney and Mariah also having stayed there, in the very room we found ourselves in shooting the portrait session- facing the Piccadilly Circus illuminated advertising board. On arrival we found Luke in one of the luxurious Grand Superior Guestrooms featuring a king sized bed, some seriously expensive and contemporary artwork, completed in Portland Stone with heated flooring- a welcome treat against the December chill. The hotel staff backed up the air of luxurious quality the room boasts in the time of need as the best man quickly realised he was missing a bow tie. Nothing was too much trouble and within twenty minutes the hotel had procured him a new one of the highest quality. The ceremony and wedding breakfast room- the opulent ballroom of the hotel was simply stunning. I wasn’t quite sure what I’d walked into when I first went inside the grade II Louis XVI style room. The ornate detailing on the ceiling and pillars has been painstakingly restored with frescos showing scenes of love in a way that can only take your breath away on first, second and indeed third inspection. Much like the Painted Hall in Greenwich. The room also gets a number of blasts from staff with fragrances before guests enter, it’s the little things that take it up a notch. Regent street can been seen through the double doors at the end which open onto a spacious outdoor area, perfect for a breather after a wedding ceremony or in the midst of the party in the evening. You’re so close to the hustle and bustle of central London, yet secluded in your own private area with none of the hassles the city brings. Due to it’s perfect location- so close to both Mayfair and Soho, guests and couples can experience everything London has to offer. Piccadilly Circus and the Christmas lighting on Regent Street create stunning visual backdrops for both videography and photography for your wedding. We fully recommend you make a little time to head out for a portrait session together to make use of this. Luke and James fully embraced this and we managed to get some stunning visuals as a result. Due to the volume of people in that area I’ve never heard so many strangers, especially Londoners, offer their congratulations and well wishes to a newly married couple. You can check shots of this out which are featured prominently in their feature cinematic wedding film. You can check out the Cafe Royals wedding website here to find out more about the venue and what the team can offer you. It’s a yes from us though if you are indeed thinking about it!